If the Okavango Delta is a pristine wildlife wilderness then Moremi is its show garden. 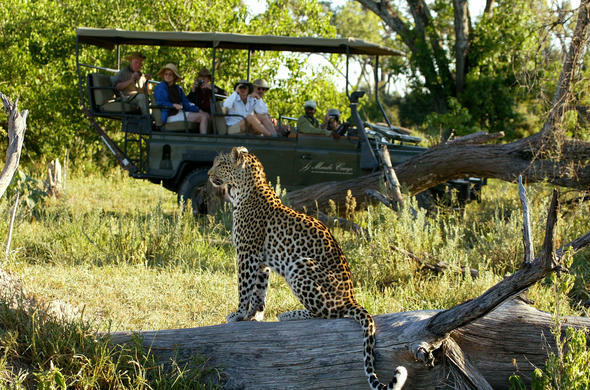 Moremi is situated in the central and north-eastern regions of the Okavango. Situated in the central and north-eastern regions of the Okavango Moremi is often described as the most beautiful park in Africa and when driving through forests of flowering rain trees and open plains filled with lechwe it is not difficult to see why the idea exists. 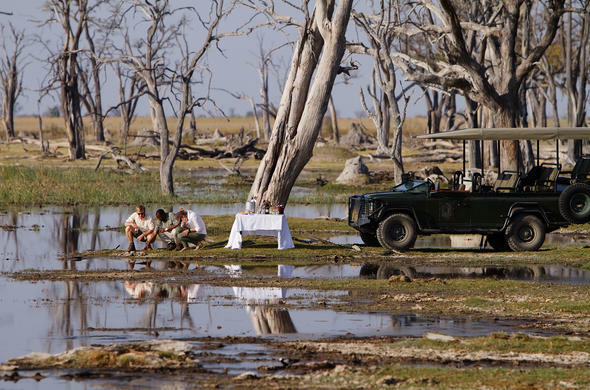 The Moremi Game Reserve is just a section of the Okavango Delta, albeit a rather spectacular section. Chief's Island, the great spit of land in the middle of the Okavango, is part of Moremi Game Reserve. All the habitats found in the Okavango Delta including seasonal floodplains, permanent delta and dry mopane woodland are present in Moremi. The wildlife of Moremi is nothing short of spectacular and the reserve includes some of Africa's best wildlife areas including Mombo, Khwai and Xaxanaxa. 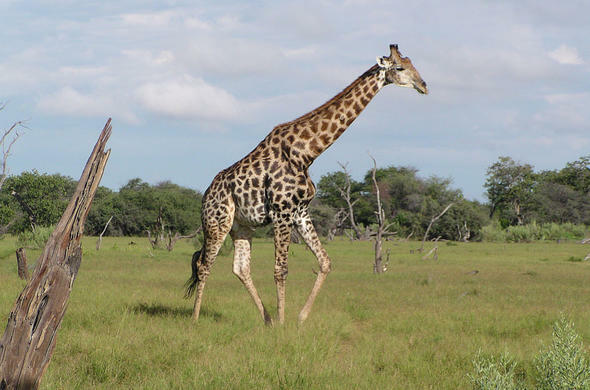 The wildlife seasons of Moremi differ slightly from area to area due to locations and positioning. 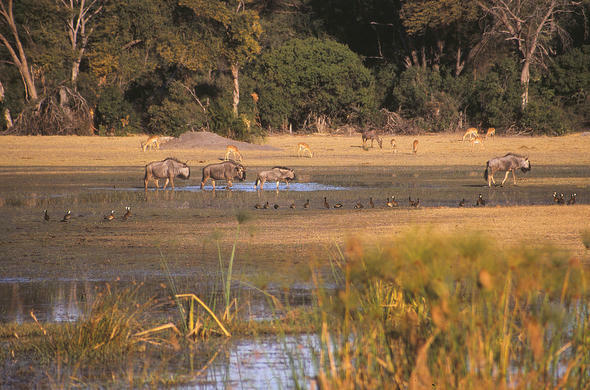 Situated at the top end of Chief"s Island, the Mombo area is the first part of dry land that the flood waters reach in the greater Okavango region and it is here where most of the nutrients carried by the water are deposited. This results in the vegetation of the Mombo area providing rich grazing and browsing for wildlife. The nutritious grass plains of Mombo support herbivores in large numbers - and with these numbers of herbivores is a high population of predators. It is easy to overlook the dramatic vistas and profusion of life in the Mombo area when there is so much drama happening. The predators of Africa are in constant competition with each for food and territory but in Mombo the competition is on another level. With a high prey population in a relatively small area the predators are found in close proximity to each other resulting in a great deal of disputes. The predator chain changes regularly at Mombo, in particular between the lions and hyenas where at times it seems the hyenas are the dominant predator and at other times the lions seem to lord it over the region. The Khwai River is the northern overflow of the Okavango Delta and, as with all the rivers leading from the delta, the water disappears into the sands of the Kalahari or evaporates into the dry season air. But it is in this path of evaporation that produces some of the continent's most dramatic wildlife interactions. As it is fed by the Okavango Delta the lower reaches of the Khwai flood late in the dry season - at a time when the wilderness is in a state of high anticipation. The water is a lifeline for the thousands of animals that utilize the Khwai. As it is reliant on the Okavango waters the level of the water varies each year - some years pushing close to its historical end, the Mababe Depression, but in other years petering to a trickle soon after leaving the main delta. With the coming of the rains the wildlife disperses into the vast wilderness areas, with only territorial species and roaming individuals to be seen, but the drama is no less dramatic than in the dry season. With the drying of the interior the wildlife begin to head towards the river again where the cycle of life and death plays out like nowhere else in Africa. Xaxanaxa is a place of floodplains, forests, permanent water channels and dramatic wildlife set on the sands of the Kalahari Desert and it is here where mainland meets the permanent waters of the Okavango Delta. Set deep in the Okavango system Xaxanaxa is the furthest spit of mainland found in the delta and here wildlife gathers in numbers. The Xaxanaxa area consists of mainland, islands, deep water channels and lagoons thus providing a range of habitats for wildlife and plants alike. Despite the deep water of the channels animals still cross onto the islands to feed. Crocodiles are present in the water but due to the lie of the land they are not as prolific here as in other parts of Botswana so the animals crossing are seldom hassled by the crocodiles. The Xaxanaxa area is also renowned for the breeding colonies of birds that congregate on the tree islands on the lagoons. Herons, storks, ibis and egrets build their nest in close proximity of each other. Boat cruises on the lagoons and channels and guided walks on the islands, together with game drives provide a range of activities that allow for a varied and fascinating Okavango Safari. Late afternoon, somewhere in Moremi. Truly one of Africa's most beautiful regions, Moremi is also a haven for wildlife with herds of elephant, buffalo and a range of other herbivores side by side with the predators and spectacular birdlife. 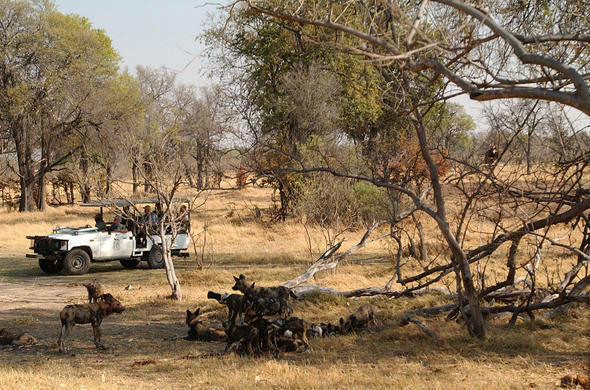 Mopane, ebony and raintree forests create an illusion of fantasy but Moremi is a place where all the dramas of the African wilderness are played out. Read our Okavango Wildlife Guide for a comprehensive selection of Moremi related wildlife articles.